If you read this blog post, then you probably already know about all the new essence launches. You might recall I was a bit disappointed that only a small selection of the range update was coming to South Africa. Well, turns out I was wrong (essence sent me the incorrect press release) and in the end, essence did spoil South Africans with the entire range update. Yay! 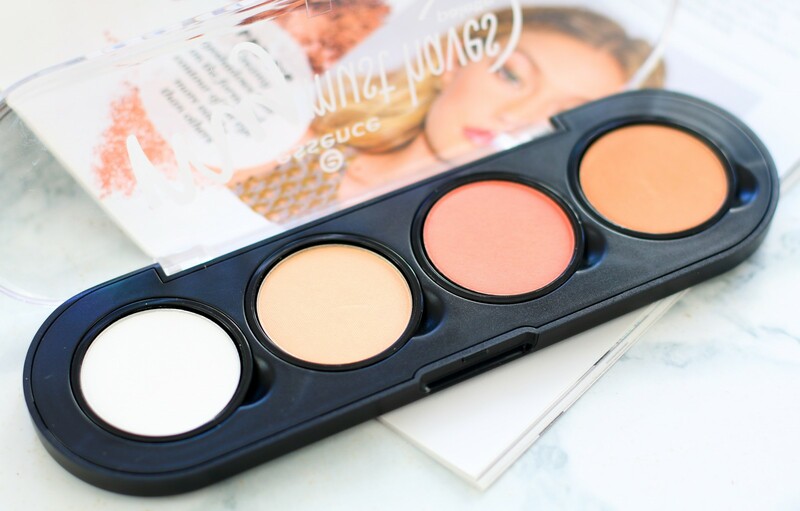 I must admit, the ‘build-your-own-palette’ concept called the essence ‘My Must Haves Palette’ was one of the products I was most excited about, and that’s why it’s the very first product I’ll be reviewing for you today. Yep, there are more essence review blog posts in the pipeline and just in case you are wondering: Yes, I am most definitely going to film another essence makeup tutorial testing (and rating) all the new products (like this one). The past few weeks have been incredibly busy for me (I’m working on a few secret projects), but going forward I’ll have a lot more time on my hands to focus on the blog and my YouTube channel. I’m excited! So here’s what you need to know about the essence ‘My Must Haves Palette’: There are currently 2 empty palettes available (a 4-pan and an 8-pan), both of which you can customise yourself. You can fill these palettes with your own selection of eyeshadows (20 shades), blushes (3 shades), lip powders (3 shades), a creamy lip base, a highlighter, a bronzer, and a fixing powder. The empty 4-pan palette retails for R34,95 and the 8-pan palette will set you back R44,95 (only a R10,00 difference – crazy, right!?). All the refill pans are the same size (whether it’s a bronzer, blush, or eyeshadow), and each retails for R34,95. Each single pan has a clear lid that pops off, and is packaged in a small cardboard sleeve. The pans are magnetic (but only ever so slightly, I popped them in my Z-palette to test the strength of the magnets and they were sliding all over the place) so you have to specifically use the essence palettes because the pans click into each opening (snug as a bug in a rug). I love that the packaging is very clean & simple, plus it’s not heavy or bulky – perfect for travelling. I purchased 4 of the face products (and the 4-pan palette) to test for you. Since then, I’ve also purchased some of the eyeshadows, all of which I’ll feature in my makeup tutorial video soon. For this blog post, though, we’ll focus on the fixing powder, highlighter, blush, and bronzer. Let’s take a look, shall we? FIXING POWDER – If I recall correctly, there is only 1 fixing powder available called ‘Fix It, Baby!’. It’s a semi translucent powder with a matte finish. I added the word ‘semi’ in there because I don’t think it will be suitable for skin tones that are dark / deep – I suspect it might look a bit ashy. As an all-over setting powder it works well, it doesn’t look cakey and melts into the skin without any powdery residue. It, however, doesn’t do a fantastic job of setting my under eye concealer (I unfortunately still experience creasing after setting it with this powder). If you already have the essence ‘All About Matt! Fixing Compact Powder’ in your collection, then this is exactly like that one but in a compact travel size. 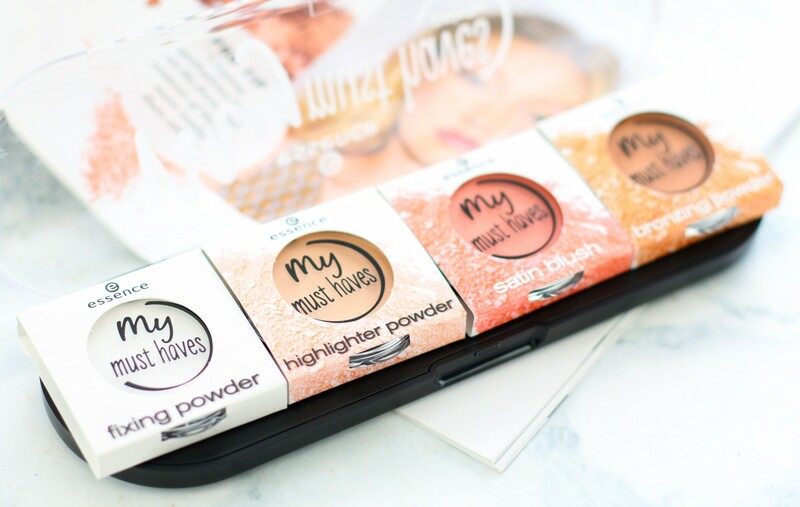 HIGHLIGHTER POWDER – Wasn’t impressed with this one, unfortunately! I bought the shade ‘Let It Glow’, which is a pretty champagne shade. BUT in terms of intensity and pigmentation, it let me down…big time! It’s not shimmery / metallic enough to be a proper highlighter – it’s almost like a satin-finish powder. You can’t use it as a setting powder because it does contain some shimmer, and you can’t use it as a highlighter because it doesn’t contain enough shimmer. I guess you could use it as an eyeshadow, but it just doesn’t pack enough punch. SATIN BLUSH – There are 3 shades available, I chose the shade called ‘Coral Dream’ (you know I love my corals). 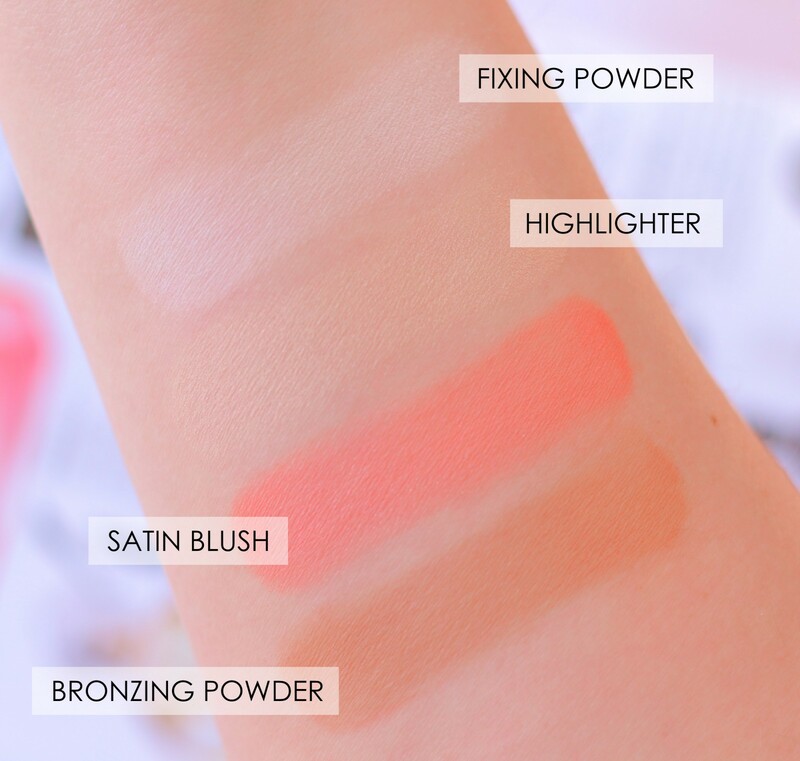 It’s VERY similar to another essence blush I have in my makeup collection – their Satin Touch Blush in ‘Satin Coral’ (so if you already have that one in your collection, you’d basically just be buying a duplicate in a smaller size). I really like the essence satin-finish blushes, they give the cheeks a pretty flush of colour with a very natural glow. ‘Coral Dream’ is a bright apricot shade (great pigmentation) with a very subtle sheen – perfect for all seasons, and I imagine it will suit most skin tones too. BRONZING POWDER – ‘Hello Sunshine’ is a stunning warm-toned bronzer that has the same formula, pigmentation, and undertone as the essence Sun Club Bronzing Powder in ‘Sunshine’ (featured here) and the essence Sun Club Matt Bronzing Powder in ‘Blondes’ (review). It does a fantastic job of warming up the complexion, without looking to orange on my fair / light skin tone. It blends like an absolute dream, and the full size ‘Sun Club’ bronzer is actually one of my favourite affordable bronzing powders at the moment. This particular shade also works really well as a matte eyeshadow for deepening up the crease of the eye. The size of the pans is bigger than MAC and Urban Decay single eyeshadows – in terms of size I’d say they’re comparable to Palladio single eyeshadows, but more bulky because of the plastic encasing. It’s a good size for eyeshadows, but a bit too small for face products in my opinion. Most of us use a normal sized powder brush or blush brush, and unfortunately these pans are a bit too small – face brushes are too big to fit in the pans. A filled 4-pan essence ‘My Must Haves Palette’ totals R174,75 – is it a bit pricey for a ‘drugstore’ product? Only if the palette is filled with: 1. Products that are ‘meh’ in terms of quality / pigmentation; 2. Shades that you probably won’t use as often as you’d like; or 3. Products / shades that you already own in a full size. The essence ‘My Must Haves Palette’ is definitely a cool concept, and I love that it’s a product that’s available at the drugstore. But from what I’ve seen (and swatched), the individual pans are definitely hit and miss. Some of the face powders are great (albeit some of them are not entirely brand new shades or products), but the highlighter just didn’t float my boat. The same goes for the eyeshadows, some are smooth & pigmented and others are not so great (you’ll have to wait for my makeup tutorial video to see which ones I’m referring to). I strongly suggest you swatch each shade (they do have tester pans that slide out on each shelf) before choosing and creating your own palette. If you decide to invest in an 8-pan palette, filling it with 8 refill pans will total R324,55. That, to me, is quite pricey for a ‘drugstore’ palette (especially since the face products are the same size as a regular eyeshadow). BUT if you are in the market for an all-rounder palette for travelling purposes that contains your face powder products and a couple of eyeshadows, then the 8-pan palette might be an option for you. *shrugs* If I were just a regular ol’ consumer (not a beauty blogger), I would probably just stick with a 4-pan palette and fill it up with 4 essence eyeshadows – especially since I already own 3 out of the 4 face products in full size packaging. You can purchase essence makeup products at Dis-Chem, Clicks, and Pick n Pay stores; or online at Red Square and Takealot.com (but Red Square doesn’t have stock of the range update yet). Check back in on the blog tomorrow, I have another review blog post coming up! Been waiting for this review from you Luzanne…definitely want to hear about the eye shadows. I did not want to get the pan case thingies, so I assumed i could get the single eye shadows and just pop it into a z-palette, so thanks for letting me know that’s not possible. Although I do have have extra magnet stuff with my z-palette, so maybe I can still go that route. The highlighter you can’t even see! The blush is quite pretty though. I don’t have these palettes but I really want to try the eyeshadows and then maybe get the empty palette as well. I’ll wait for ur makeup tutorial and ratings before I buy, I trust your reviews. Thank you for your honest review. Is the bronzer suitable for medium toned skin? Great review- thanks! 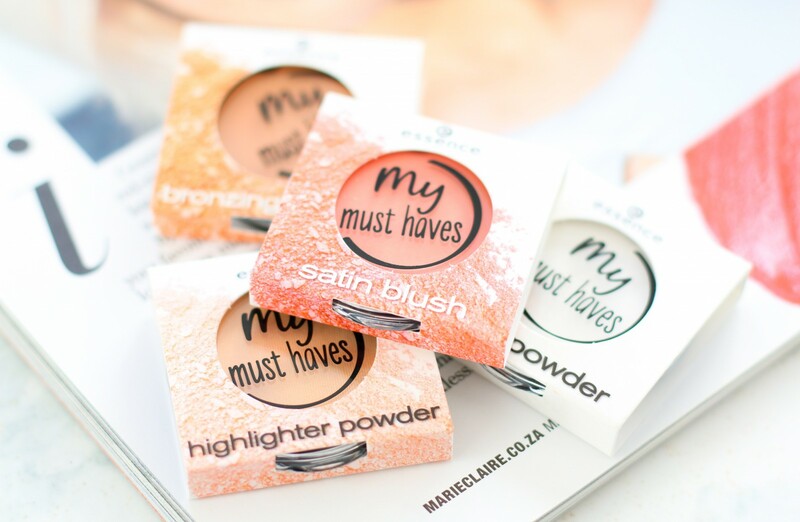 I like the look of the bronzer and the blush, but the highlighter looks non-existent..
I’ve been looking at these and wondering about them each time I go to Dischem. I might invest in a 4-pan palette and a couple of things like a blush and a bronzer, and maybe 2 eyeshadows (or just do two blushes and two bronzers) for travel convenience. Otherwise I think this is a concept I’ll give a miss to. Thank you for such a good review! Really like the sound of this customisable palette but I’ll have to see your swatches of the eyeshadows before I decide what to get. Thank you for always being honest about your experiences with products, Luzanne, it’s why I always read your blog posts. It’s difficult to trust bloggers with all the free stuff floating around these days, but I know I can always count on you to let us know when a product doesn’t work. Hi there 🙂 Do you know of any other affordable single pan eye shadows available in South Africa? I haven’t been able to find a palette with only matte shadows that’s appealed to me as yet, so I thought I’d rather create my own.